A business is nothing without signage and thus, it was a lack of signage that was causing a major problem for the Centre for Hyperpolarisation in Magnetic Resonance (CHyM). 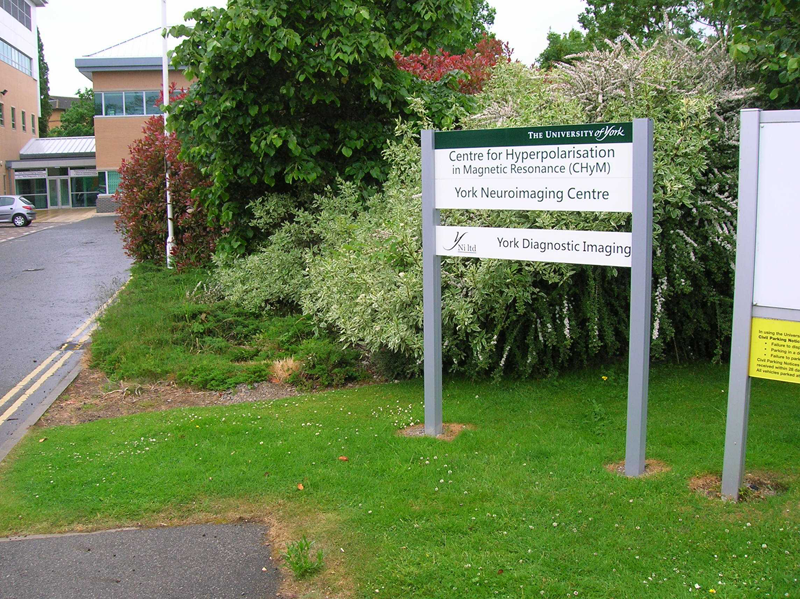 Based on York Science Park, CHyM is part of the Chemistry department at The University of York, but the lack of signage meant that it was all but invisible to visitors. Consequently, CHyM enlisted the aid of Signarama York, with Professor Simon Duckett, Head of CHyM, requesting that Signarama make the centre easier to find, while also operating within the confines of a strict budget. Signarama York’s approach was to install an external post and panel sign at the entrance to the site, using the University’s corporate colours of traffic green and white and complementing it with the series of window graphics that now grace the large expanse of glass that is one of the architectural features of the main entrance to the CHyM building. The finished result is simple yet effective and provides CHyM with the presence on the York Science Park campus that it had previously lacking.